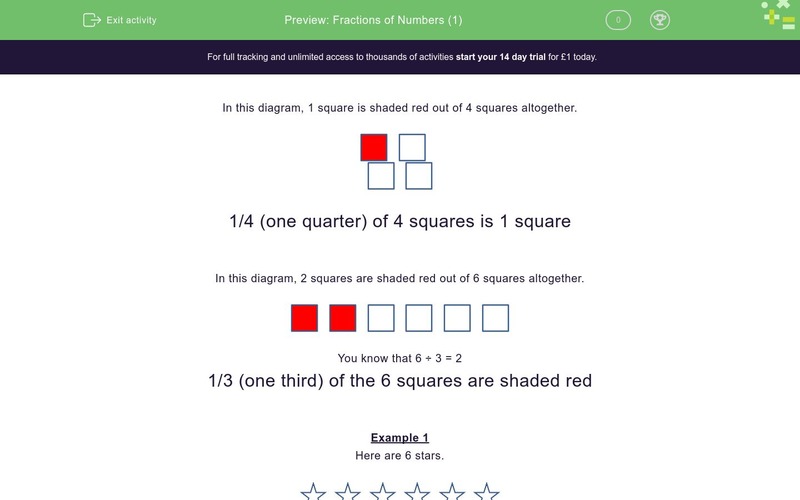 In this worksheet, students must find simple fractions of numbers using pictures. In this diagram, 1 square is shaded red out of 4 squares altogether. In this diagram, 2 squares are shaded red out of 6 squares altogether. Anna colours ½ of them red. How many does she colour red? She colours 3 of them red. ½ (one half) of the stars are shaded red. Anna colours 1/3 of them red. She colours 2 of them red. 1/3 (one third) of the triangles are shaded red. What is ½ of 6? What is ¼ of 8? What is 1/3 of 6? What is ½ of 10? What is 1/3 of 12?